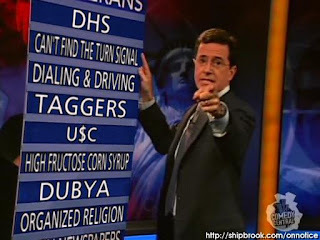 who knew stephen and i hated the exact same things!? i was just kvetching the other day about the countless plastic bottles associated with my newfound bikram yoga habit: bottles of water; bottles of gatorade; bottles of vitamin water; bottles of propel fitness water. and then the path to freedom urban homestead folks had this little post: bottled water is like driving a hummer. they suggest purchasing one of their stainless steel water bottles as an alternative (yes, these hippies are serious capitalists). i'd try that, except after a bikram yoga class, i'd expect that my water would be hot enough to make tea! i've been lugging around one of those faux-nalgene bottles for a while, but if i forget it, i just buy the water before my class. now, i'm going to make a serious commitment to keep it by my side and try not to be tempted by the fancy vitamin waters and sports drinks. i'm sure by pocketbook will be happier, too. "At age 41 you will die from wounds delivered by a blender after trying to make your sixteenth magarita [sic] of the day. (And it's on 3:00pm, shame on you!)" The Amazing Death Predictor would seem frighteningly prescient, except i drink my margaritas on the rocks, not blended. for all of you knitters out there, here's the specs. it's a seed stitch border with seed stitch "spacer rows" (for lack of a better word) and stockinette stitch squares in between. it's nice because it looks like patchwork, but it's not separate squares (after two granny square afghans, i vowed never again would i stitch another blanket together). 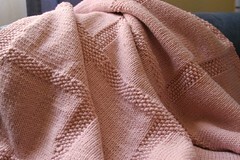 the pattern called for merino wool, but i used a 50/50 merino-cotton blend so it would be nice and soft. i thought i had my gauge correct, but it turned out a little bigger than the 21 x 24 inches; mine's more like 25 x 27 inches, or so. it could have something to do with the cotton blend. 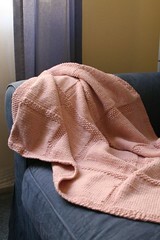 i knit it on size 3 circular needles. this project became quite an obsession, as i started a little late and bit off a little more than i could chew. i was knitting for about two solid weeks from when i got home at night until i went to bed and at every spare moment in between: at lunch, on the bus, during half-time at the basketball games! there are a bunch of mistakes, but i don't think the baby will notice and hopefully it makes the gift that much more "charming." in which order do you put your shoes and socks on? ?se habla espanol, suc "student" athletes? i fear this blog is fast becoming one long rant about why i hate suc, but they just make it so easy. apparently, it turns out that some of their football players, the dumbass song girl who cheered for a texas touchdown and several other athletes can't hack the courses at suc, so they tried to take the easy way out with a guaranteed a (or b, if you're lazy and don't show up for class) with a former suc grad who teaches an easy spanish class at l.a. trade tech.